Browse or search through articles and tools to help you reduce energy use. Dive into resources categorized by specific energy-efficient technologies. Find the right resources to support your role. Here are some common topics to get you started. Uncovering the specific drivers of your building’s energy usage, and how it stacks up with others, is often the first step in making strategic, cost-effective energy upgrades that help you reduce energy waste, lower costs and stay competitive. When you can learn to operate your building more efficiently through energy-efficient maintenance practices and equipment troubleshooting, you’ll lower costs, improve comfort and further differentiate yourself in the market. Strategic Energy Management (SEM) helps you embed long-term energy-saving practices into the key areas of your building operations: people, manufacturing systems, measurement, and organizational structure. By learning how every aspect of your building works together, you’ll be able to incorporate holistic efficiency into your next commercial project to save you or your client energy, time and money. Tailored to your needs and preferences, the Commercial Real Estate (CRE) Hub helps you narrow your list of resources to quickly access the tools you need the most for building design, use, operation and maintenance. The owners of a popular pizza restaurant in Corvallis, Ore., experienced high energy bills and poor ventilation and airflow — a particularly vexing issue for businesses with commercial kitchens. Many culprits were to blame for these issues, including leaky and poorly insulated walls, large make-up and exhaust air openings from the venting system that serves the pizza oven, and a number of additional air supply and exhaust pathways that weren’t in service but nonetheless resulted in significant air leakage. The goal of BetterBricks is to accelerate the adoption of energy-efficient best practices in the commercial industry. BetterBricks created a strategy to support the adoption of a real estate strategy called building renewal that helps owners, managers and tenants conduct whole-building, deep energy-efficiency retrofits of existing properties. 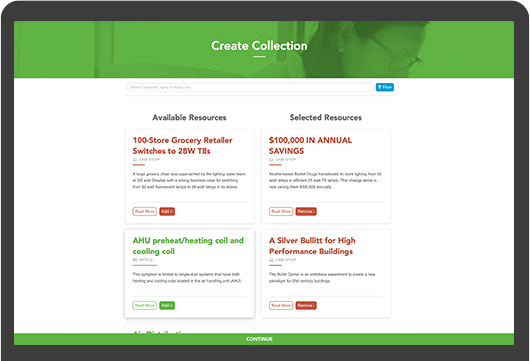 Create a unique collection of resources to build a business case or to help implement a project.